Rebuild Libertatia // Η LIBERTATIA ΘΑ ΜΕΙΝΕΙ from Rebuild Libertatia on Vimeo. 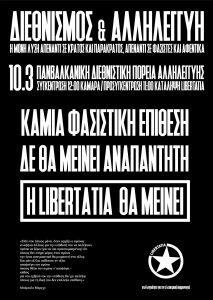 On 10/3 a big pan-balcanic solidarity demonstration happened in Thessaloniki. About 5000 people from all the Balcans participated to stand up against fascism and express their solidarity with the squat and people of Libertatia. Am 10.3. fand in Thessaloniki die Pan-Balkanische Solidaritätsdemo statt. Es nahmen ungefähr 5.000 Menschen aus dem ganzen Balkan teil, um ein Zeichen gegen den Faschismus zu setzen, und ihre Solidarität mit der Besetzung Libertatia auszudrücken. 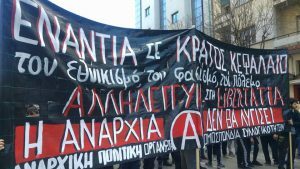 Solidarity to squats – Libertatia will stay! 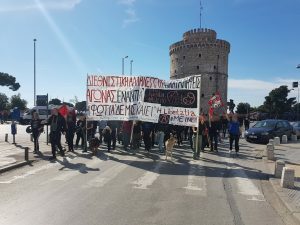 Starting from the so-called “Macedonian” issue, we think it is not necessary to mention again what happened in the two rallies of Thessaloniki and Athens, which political forces have derived political surplus value from the people who where there, how fascism was washed away in the dust of oblivion. These are things that the anti-fascist movement (and our collectiv respectively) have thoroughly analyzed lately. What we want to point out is the importance of publicly announced anti-concentration against nationalist rallies, as they have shown that even in the worst days of nationalist frenzy, the people of the struggle will be on the streets. Considering the volume of the Macedonian rallie, but without fear, comrades standed in Kamara – Thessaloniki (21/1) and Propylaea – Athens (4/2) against the delirium of those days. Recognizing the historical significance of such events, part of the movement decided not to let bigotry, racism and fascism to act undisturbed in the public space and the central political scene and stood opposite them proposing internationalism and class solidarity. It has decided to express the people that stand against nationalism, war and hatred to everything different. Without wishing to put the matter of protecting the squats at a second place of importance, we consider that these actions act in a passive level of addressing the sociaty, which, of course, we recognize that it did not happen as it should in the case of Thessaloniki. These gatherings have to remain as political and historical memoirs for the movement, and additional effort is needed so as to quantify and qualify these moves in the coming years to face the fascist threat on the streets, to answer publicly to nationalist rhetoric and to fight massively against chants of hatred that have risen in the wider region. Therefore, one of the two main challenges at the moment is international solidarity. Against the increasing nationalism in the Balkans and the eastern Mediterranean, the embankments of internationalism and solidarity among the oppressed must be built. As we have emphasized in our analysis of the Macedonian issue: “Internationalism, then, is the only feasible, unifying and peaceful solution. This is because it does not seek the extermination of populations and entire folks. On the contrary, it proposes the solidarity among the proletarians and oppressed against those who exploit us and destroy our lives. And let’s not fool ourselves. Content may change, but the form of exploitation is the same on both sides of the border, as in every state. 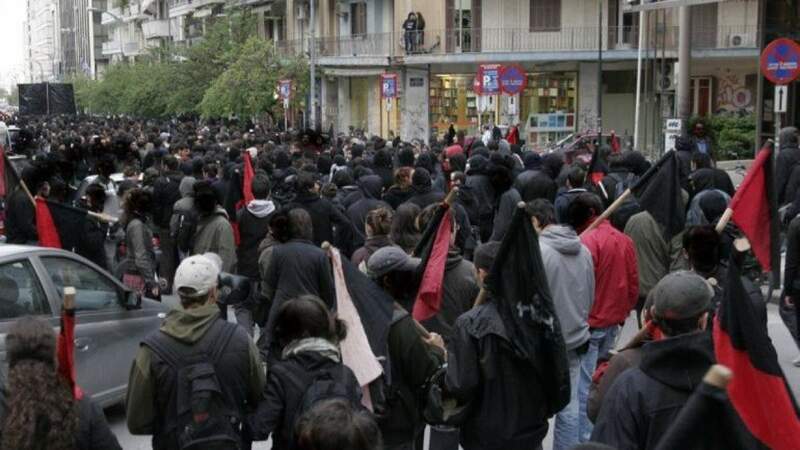 Ιmpoverishment, degradation of our lives, removal of our rights are only some of the aspects of the attack that has been unleashed against us by the state and the capital. And the only real resistance is class-antistate-internationalisτ. “And that’s exactly what we’re going to do on March 10th. Side by side with comrades from other Balkan – and not only – countries, we will show that there are people who resist the absurdity of war, hatred and nationalism, people who see real enemies from all sides of the border, that are no other than the state and the capital, along with their reserves, the fascists and the parαstate gangs. We believe that massive and feisty answers have to be given against the fascist threat. The struggle against fascism is not a confrontation of two “extremes,” as it appears to be presented by the dominant narrative of the state and its ideological mechanisms to conceal the historical role of fascism as a reserve of the existing system. On the contrary, it is part of the struggle of the oppressed parts of society against their oppressors and the gangs they use to intimidate and suppress the people that resist. This battle can only be done in terms of social direction, in order to thicken the lines of the anti-fascist movement, as well as with combative attidute to crush all fascists on the streets. Against the logic of a sterile denunciation of fascist violence and the logic of confrontation with fascists in hooliganist terms, we suggest the further organization anti-fascists with class, combatitive, and anti-hierarchical characteristics. By providing solutions to the ever-increasing problems of the oppressed parts of society, we are building our own structures, which are fighting for a society of equality and freedom. Operating without dominative and exploitative relationships, we are preparing the anti-fascist movement to intensify our struggles in massive terms, building up embankments to fascism and nationalism, and eliminating them from the public domain (workplaces, schools, universities, neighborhoods, parks, stadiums). The shock of the arson of an occupation, which is, a structure of struggle and resistance, is great. 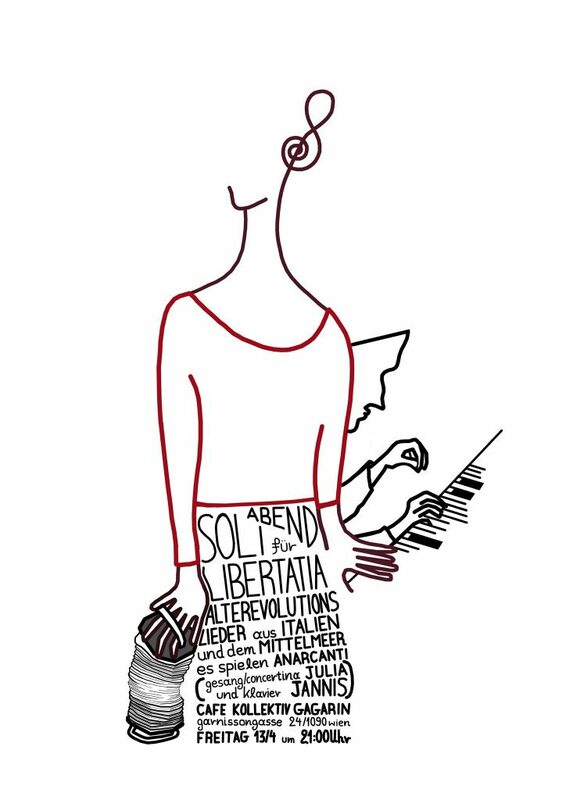 However, the emergence of solidarity at material, moral and political level and the power of the movement to rebuild what has been shattered by the destructive forces of fascism in one day,with all its forces assembled at one point, overcomes every obstacle, highlighting the second stake that exist at the moment. That is, that of showing solidarity to squats and defending the structures of the struggle at a central political level. 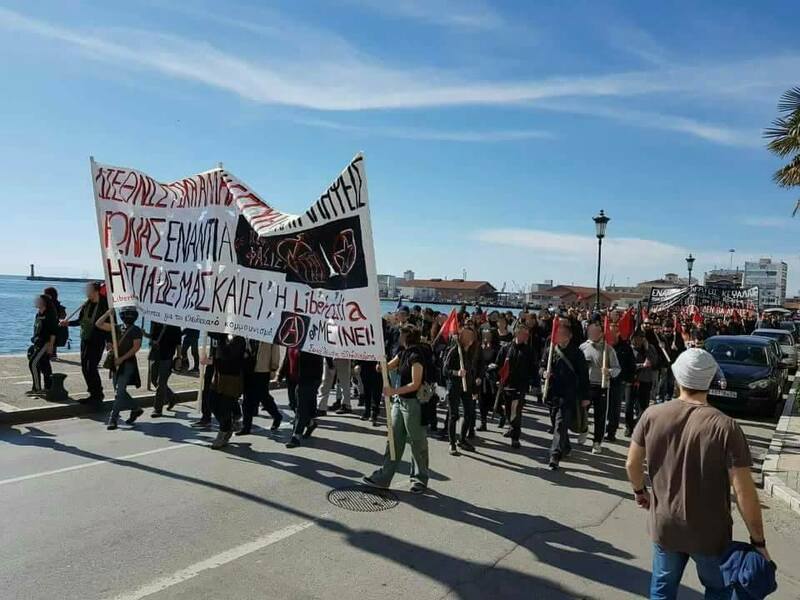 At the moment where the attacks on occupations and free social spaces of fascist gangs have intensified, the movement must respond by defending them. . 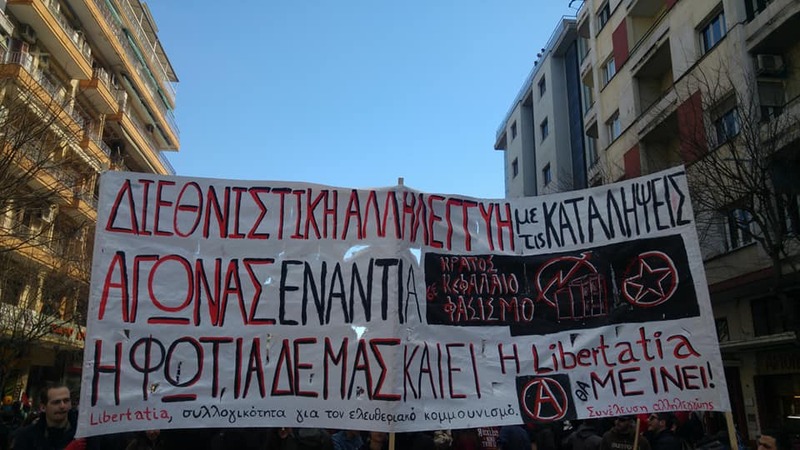 Following the events that took place in the days of the two rallies for the Macedonian issue, the latest attacks on the occupation of Lelas Karagiannis (Athens), the followers of the self-organized group of Progressive Toumpa (Thessaloniki), the Free Social Space of Favela (Piraeus) and the squat of Panetolio 21 in Koukaki (Athens) show the attempt to intimidate the people of the struggle from the parastate, which always acts in addition to state repression. Our structures, however, do not simply cover housing needs of people, but they are also spaces of resistance to the existing, fields of creating relations of equality, solidarity and respect among the oppressed people and the vision of a better world. That is why we will defend them by all means, highlighting their importance and role. 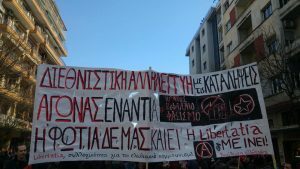 By putting the issue of defending occupied spaces and Libertatia squat as a center issue out in the streets, we propagate and highlight the squatting projects, their role in the wider movement and society, and make it clear to the state, the capital and the fascists that we will defend our structures, making the occupation a social term. We call the people of the movement to support the pan-Balkan internationalist demo of solidarity in Libertatia, with the proposals of international solidarity and the defense of squats and the structurs of the struggle. 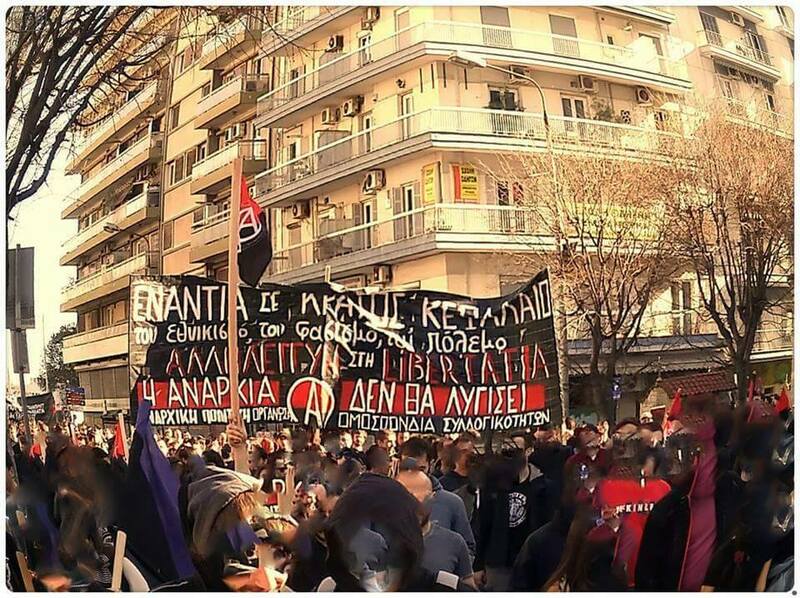 In continuation of the reflective demo for the arson of our occupation on 22/3 and the actions of solidarity all over Greece and other countries, we call comrades from Greece and the Balkans on 10/3 in Thessaloniki to give a mass answer to nationalist frenzy and fascist attacks. No fascist attack is left unanswered. Libertatia will stay! A few weeks ago we all witnessed an incident that shuddered the neighborhood of Faliro in Thessaloniki. The arson of Libertatia squat, the neoclassical building in L.Stratou & Sarantaporou, the roof of some people but also of libertarian ideas, one of the few old buildings preserved in this city. This happened on the day of the Macedonia demo, where the people closed the streets to come out to defend the “greekness” of Macedonia. Once again in society, pseudo-dilemmas are spreading that disorientate it from reality, offering fertile ground to its creeping fascism. „Libertatia stands for libertarian, inspired by the semi-mythical liberal community of pirates around 1600. As then, the waves of our lives have led us to a self-managed raft towards freedom.” (From the first brochure of occupation “The need for housing and the solution to occupation as a means of revolutionary action”). In 2008, the mansion was occupied at the corner of the Army and Sarantaporos street, giving it life after many years of desolation. We tried to make it sustainable and we did it, which, due to its age and its architecture, was achieved with great effort, with our own money and help from comrades. Of course we did not expect any rewards, our satisfaction was moral and political. The assembly of occupation laid the foundations based on equality and anti-hierarchy. This created a place open to all those who are struggling to overthrow a social system based on exploitation. In the summer of ’09 there was a call in the neighborhood for a meeting. This call took place because the neighborhood for us is and remains vital space for intervention, so every event was firstly addressed to it (with texts, posters, interventions). Our good relationship with it is still evident today, when during the attack the people came out to the balconies shouting to the fascists, who of course replied with sworing and bengalen. Anyway, the people of the neighborhood know well who and why they burned the occupation, they are next to us and support us, and this attitude gives us the power to remain in the building and to repair the damage. Besides our ideas, Libertatia housed ourselves, housed the needs of people without the intermediation of rent, people who did not have the means to rent a home, such as immigrants and people of the lower social classes. The squat, despite the difficulties it had to overcome due to the problems concerning the building, held a steady social profile without, of course, losing its political identity. Movie projections of the film group took place almost every week, and also the occupation bar. Concerts were also frequent. But one of the most important activities was the structure of self-education. Like every revolutionary movement that existed before and set its foundations on education, we also tried to study revolutionary theory and history. By opening it to society, we set the terms of our revolutionary function: “action requires knowledge and knowledge requires education”. All of this will of course continue to exist because Libertatia will stay. The rebuilding has begun and we are ready. But the problem is not only the destruction of an occupation. The problem is fascism and the society that nourishes it. Fascism is not only golden dawn and the various far-right groups, nor all those “bad” things we know from history that it did, but is also the passivity and the apathy, is also the society that observes history but doesn’t change it, does not speak, and does not take position. It is clear to everyone that what happened could not be done without the cover-up of the rally. Let everybody therefore consider his attitude towards fascism. As a closure, we would like to say that the decision to rebuild the building comes from our will to respond to the disastrous tendency of fascism. For us, occupations are not their walls, but the people – they are the relationships that are built within them. It is structures of struggles that take us out to the road. The occupations are us. And we will prove that the anti-fascist movement has the will, the forces and the determination to rebuild what has been destroyed. Libertatia will stay and the building will be rebuilt on our own means, with our own people. This will be the best answer to the state and its fascist gangs. It is a great challenge for the people of the struggle all this process and its ultimate success will show that we can live and create without state, capital and power. It is a battle that has to be won and will be won. 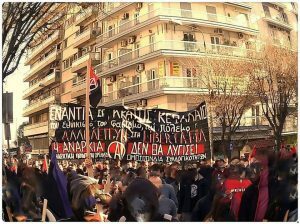 Antifascist Demonstration in Saloniki 10.3. Am Sonntag, dem 21. Jänner 2018 um 13.30 Uhr und kurz vor der nationalistischen Kundgebung für Mazedonien, begannen eine Reihe von Angriffen gegen besetze Räume – durchgeführt von faschistischen Gruppen, die sich an der Kundgebung beteiligten. Nachdem sie den freien sozialen Raum „Schule“ (Scholio) angegriffen haben und erfolgreich zurückgeschlagen wurden, näherten sie sich unserer Besetzung, und verursachten Schäden an Fassade und Zaun. Diese Angriffen entstanden aus der Versammlung vom Ideapolis-Zyklus und verschiedenen anderen faschistischer Gruppierungen (AME, Heiliger Bund, C18). Der Schaden wurde direkt danach von Mitgliedern unserer Gruppe repariert. Danach wurde entschieden, die antinationalistische Kundgebung in Kamara zu unterstützen. Die Faschisten versuchten die dort versammelten Leuten anzugreifen, jedoch vergeblich. Danach griff die gleiche Gruppe (mit den faschistischen PAOK-Hooligans und verstärkt durch serbische Hooligans) etwa zwei Stunden später unsere Besetzung mit Molotowcocktails und Fackeln an, und verursachten den Brand. Zu dieser Zeit waren keine Leute im Gebäude, denn alle waren bei der Demonstration in Kamara. Während des Angriffs standen Staatspolizisten daneben, sowie ein parkierter Polizeibus. Diese Polizeikräfte deckten den Angriff, ohne sich einzumischen. Die Reaktion der Nachbarschaft muss erwähnt werde: Die Leute gingen auf die Balkone und schrien gegen die Faschisten an, diese reagierten mit Schimpfen und dem Werfen von weiteren Fackeln. Als die Faschisten danach erneut versuchten, sich der Besetzung „Schule“ zu nähern, reagierte die Polizei nach dem gleichen Muster. Sie deckte die Faschisten ab und blockierte unsere Genossen im Gebäude. Zu den Ereignissen am 21.1. Über das was geschah, sollte es keine Ausreden geben. Wir wissen alle, dass diese Gruppen auf die Kundgebung am Weißen Turm zusteuerten und sich später von dort wieder lösten. Die Kundgebung am Weißen Turm fungierte als „Teich von Siloah“ für den griechischen Faschismus, der noch einmal durchs Abwasser gespült wurde. Neue politische Karrieren wurden an den Tag gebaut, und viele Politiker spazierten ungestört durch die Menge. Die Mörder von Golden Dawn wandelten unter den „Indignados“ unserer Mitbürger und zusammen mit den neuen Sturmabteilungen, die eine Reihe von potentiell mörderischen Angriffen machten und von der Polizei dabei freundschaftlich unterstützt wurden. Verschiedene andere Parteien der Rechten waren dabei (Nea Dimokratia, ANEL), eine ausverkaufte nationalistische Linke (LAE, Fließen der Freiheit), Träger der christlichen Liebe unserer heiligen Kirche, aufstrebende Parteiführer. Alle möchten nun endlich eine ernsthafte rechtsextreme Institution schaffen, welche dieses Land angeblich so sehr braucht, ein Plan, der nach der Ermordung von Pavlos Fissas abgesagt werden mußte. 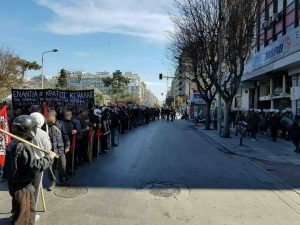 Faschismus hat nunmehr soziale Legitimität in der griechischen Gesellschaft erlangt, und es liegt an der antifaschistischen Bewegung, die Situation umzukehren. Und das alles in Thessaloniki, in der ehemals multikulturellen Hauptstadt des Balkans, der Stadt der Zuflucht, der Verfolgung und Vernichtung von Juden und anderen Bevölkerungsgruppen, der ermordeten Arbeiter von 1936, der paramilitaristischen Verbrecher mit Dreirädern, der großen Armenmutter. In all den Verbrechen des Faschismus und Nationalismus, die in dieser Stadt geschahen, kam die Brandstiftung eines historischen Gebäudes, älter als ein Jahrhundert, hinzu. Unglücklicherweise ist jedoch jeder, der sich nicht an seine Geschichte erinnert, dazu verurteilt, sie zu wiederholen. Jeder sollte seine Einstellung zum Faschismus reflektieren. Die Trägheit, die Apathie und das Klima der Entpolitisierung, das den Faschismus täglich nährt, haben als Zünder für die Explosion dieses Tages des nationalistische Taumel beigetragen. Denken wir alle darüber nach, woher die Faschisten die Kraft nahmen, für wen sie gearbeitet haben, unter welchen Schutz sie all das getan haben, was sie getan haben. Wir werden immer mit unseren Genossen und Genossinnen da sein, um unseren täglichen Kampf gegen den Faschismus zu führen und unsere Barrikaden bis zu seiner vollständigen Ausrottung erheben. Unter den Faschisten, die die Kundgebung in Kamara angegriffen haben und die den zweiten Angriff gegen unsere Besetzung gemacht haben, waren auch Fans von PAOK, was durch unverwechselbare Zeichen, sowie durch die Slogans, die an die Wand unserer Besetzung geschrieben wurden, erwiesen ist. Wir wollen klar sagen, dass es ein vulgärer Versuch des Brandstifters Boutari (Bürgermeister von Thessaloniki) ist, das ganze als Konflikt zwischen PAOK-Fans erscheinen zu lassen, womit er die Tatsache herunterzuspielen und zu verdrehen versucht: der Angriff auf unseren Raum geschah aus klaren politischen Gründen und war kein Konflikt zwischen Hooligans. Das Statement, welches später von PAOK-Fans veröffentlicht wurde, fand in den Worten von Boutari Evidenz und Resonanz, um die Faschisten in der Fan-Welt zu verstecken. Dieses Statement ist nicht einmal unterschrieben und viele organisierte Fangruppen haben sich nachher davon distanziert. Wir rufen die antifaschistische PAOK-Fans und jede Gruppe auf, ihre Haltung zu diesen Ereignisse einzunehmen und die Faschisten in den Stadien und überall sonst zu isolieren. Denn Antifaschismus ist für uns kein Tuch oder Lebensstil, sondern eine politische Entscheidung und historische Verantwortung. Wer für seine Sache nicht gekämpft hat. Während dieser degradierten Situation entschied sich unser Kollektiv, den Weg den Faschismus zu hindern und die Verantwortung dieser politischen Entscheidung zu tragen. Der Preis, den wir bezahlen, ist hoch und von uns selbst zu zahlen: Ein Gebäude, in dem unsere Ideen, unsere Anliegen und unsere Träume von einer Gesellschaft der Gleichheit und Freiheit ohne Macht und Ausbeutung untergebracht waren, wurde völlig zerstört. Ein Gebäude, das wir unter hohem Aufwand renoviert hatten, und welches wir aus der vorherigen Situation des Verfalls, in dem es war, befreit haben. Das, woran wir glauben, und diejenigen, für die wir kämpfen, sind nicht nur Gebäude und daher werden wir weder zurücktreten, noch den Kampf in diesen kritischen Momenten im Stich lassen. Stattdessen werden wir in unseren Überzeugungen bewusst bleiben und in unserer Hartnäckigkeit gestählt. Der Fall von Libertatia betrifft natürlich nicht nur uns, sondern ist eine Sache der ganzen antifaschistischen Bewegung, die die Antworten auf die Feinde der Freiheit geben sollte. Wir verteidigen die politische Entscheidung bei der antinationalistischen Gegendemo in Kamara, die am selben Tag der nationalistischen Kundgebung stattfand, teilgenommen zu haben, denn wir glauben, dass der Krieg gegen Faschismus auf der Straße und gekräuselt durch organisierte Bewegungen sein muss. Er ist kein hooliganmäßiger Konflikt zwischen „extremen“ Gruppen. Mit der Entscheidung der Anarchisten zu handeln, sich in diesen Tagen nicht ruhig zu verhalten, sondern mit einer massiven Sound-Kundgebung, einer Motorrad-Demo durch die Innenstadt und schließlich mit der Kundgebung in Kamara eine Stellung einzunehmen, wurde eine historische Entscheidungen getroffen und das Gewicht ihrer Verantwortung wurde damit gehoben. Die Linke war leider bei dieser historischen Verabredung abwesend und entschloss sich, etwas dermaßen Massives nicht zu konfrontieren, weil damit eventuell ihr soziales Profil eingeschränkt werden würde. Aber die wichtigste und schwierigste Entscheidung, die wir getroffen haben war, die von verschiedenen anarchistischen bzw. antiautoritären Gruppen organisierte, internationalistische Kundgebung nicht durch unsere Abwesenheit zu schwächen. Trotz dem Angriff auf unsere Besetzung, was für uns als Endergebnis unerträglich ist, waren wir aber für den Rest der Genossen, die in Kamara waren, politisch korrekt und verantwortlich. Für diejenigen, die fragen, warum die Leute, die den Schaden reparierten nicht dort geblieben sind oder warum es keinen Schutz für die Besetzung gab, wollen wir auf den Wert des menschlichen Lebens reflektieren und was solche Verluste bedeuten würden. Außerdem möchten wir die Tatsache hervorheben, dass das Vorhandensein einer dynamischen Gegendemo, in einem großen Teil des Stadtzentrums den Neonazis keinen Raum gab, und damit potenzielle Angriffe bei anderen Besetzungen verhindert wurden, aber auch Pogrome gegen Migranten, LGBTQ-Personen, alternative Jugendliche, etc. Was beim Libertatia passiert ist, hätte auch anderswo gemacht werden können. Gerade jetzt ist nicht die Zeit für offensive Bewertungen und kannibalistische Verhaltensweisen uns gegenüber. Innerhalb der antifaschistischen Bewegung ist es vielmehr die Zeit für Demos und kollektive Antworten gegen den Faschismus, der seinen Kopf hebt und versucht sich sozial zu legitimieren. In solchen Momenten sind die Entscheidungen, die wir treffen, historisch und die Bewegung muss den Weg den Faschisten hindern. Am Tag nach dem Angriff wurde vor der Besetzung ein Demo organisiert, welche von etwa 2.500 anarchistischen und linken Leuten besucht wurde. Unsere Absicht war in die Stadtteile von Ost-Thessaloniki zu ziehen, und die „Schule“ zu erreichen. Die Polizei ließ den Zug nicht losgehen und blockierte ihn sowohl in den Straßen Delphon als auch Konstantinoupoleos und zwangen ihn durch enge Straßen. Aus einem trivialen Grund griffen sie den Zug an und nahmen fünf Menschen gefangen, unter ihnen eine Genossin von unserer Gruppe. Die Entscheidung der Polizei für den Angriff auf die Demo und die anschließende Inhaftierung von Genossinnen und Genossen für vier Tage, zeigt auch die Einstellung des Staates uns gegnüber. Während sie an einem Tag freundlich die Faschisten bei Besetzungsverbrennungen beschützen, machen sie am zweiten Angriffe auf eine Großdemonstration und verhaften Militante, die sie für die Brandstiftung eines Reifens eines Polizeibusses verklagen, nur wenige Stunden nachdem sie zugeschaut haben, wie ein ganzes Gebäude niederbrannte. Die Tatsache, dass diese Straftat durch die Staatsanwaltschaft unter dem Vorwurf der Brandstiftung verfolgt wird, zeigt die Entscheidung der staatlichen Politik, die antifaschistische Bewegung zu unterdrücken. Dieser Paragraph impliziert eine Brandstiftung bei der Gefahr für Menschenleben besteht. Der Fall, bei dem dieses Risiko bestand, ist für jeden offensichtlich. Die Frage ist, wie es weitergehen wird. Der Wille unserer Kollektive besteht darin, das Gebäude besetzt zu halten, wieder aufzubauen und wieder in Betrieb zu nehmen. Wir erklären es offen für angehende Gärtner, Regierungsbeamte, Faschisten und alle Arten von Gaunern: LIBERTATIA BLEIBT! Wir werden es niemandem leicht machen, oder gar das Gebäude verlassen, sondern den Weg des kompromisslosen antifaschistischen Kampfes fortsetzen. Wir danken denjenigen, die ihre praktische Solidarität bewiesen haben, Genossinnen und Genossen aus allen Teilen Griechenlands, aber auch aus dem Ausland. Diese Einstellung gibt uns die Kraft weiterzumachen, denn in solchen Momenten wird echte Solidarität erprobt. Solidarität entsteht nicht als bloße Verpflichtung, sondern als revolutionäre Aufgabe. Wir möchten, dass die Menschen, die bereits mobilisiert wurden, aufmerksam bleiben und bald über unsere Pläne und die nächsten geplanten Schritte informiert werden. Ebenso wichtig ist in dieser Zeit die Reaktion der antifaschistischen Bewegung, die auf die Ereignisse mit Einheit und Dynamik auf der Straße und in der Öffentlichkeit reagieren muss. Die Faschisten und Nationalisten dürfen in der Öffentlichkeit keinen Platz haben, stattdessen gilt es den Internationalismus, den Klassenkampf und die Solidarität hervorzuheben, zusammenzukommen und die Bevölkerung gegen den gemeinsamen Feind zu vereinen: also gegen den Staat, das Kapital und ihre Einsatzkräfte, und gegen die Faschisten. DEN HASS UND DEN ZORN, DEN IHR IN UNSEREN HERZEN GEPFLANZT HABT, FINDET IHR VOR EUCH. TROTZ ALLEM: LIBERTATIA WIRD BLEIBEN! AUSDAUERNDER ANTIFASCHISTISCHER KAMPF GEGEN FASCHISMUS UND NATIONALISMUS! Am Sonntag dem 21. Jänner 2018, um circa 13.30, kurz vor dem Start der nationalistischen Demonstration für den Namen Mazedonien, haben faschistische Gruppen, die an dieser Demo teilnahmen, eine Serie von Angriffen auf verschiedene Besetzungen in Thessaloniki begonnen. Nachdem sie das freie, soziale Zentrum Sxolio angegriffen haben, wo sie mit Erfolg zurückgeschlagen werden konnten, griffen sie unsere Besetzung an und verursachten Schäden am Zaun und an der Fassade. Diese Schäden wurden von Mitgliedern unserer Gruppe sofort wieder repariert. Unsere Gruppe entschied sich danach, an der anti-nationalistischen Gegendemonstration auf Kamara teilzunehmen. Nach etwa zwei Stunden wurde unsere Besetzung von einer Gruppe von 60–70 Faschisten erneut angegriffen. Dieses Mal mit Molotowcocktails und Bengalen, wodurch das ganze Haus in Brand gesteckt wurde. Zu diesem Zeitpunkt befand sich niemand im Gebäude, wegen der Versammlung auf Kamara. Während der ganzen Attacke auf die Besetzung waren Zivilpolizisten und ein Bus der Spezialeinheit MAT vor der Besetzung parkiert. Sie schützten den Angriff und zeigten keine weitere Reaktion. Die Reaktionen der Nachbarschaft müssen jedoch erwähnt werden: Die Leute standen auf den Balkonen und schrien die Faschisten an. Diese schimpften Beleidigungen zurück und warfen auch auf die Nachbarn Bengalen. Als die Faschisten danach erneut die Besetzung Sxolio angriffen, legte die Poliziei dieselbe Parteilichkeit an den Tag: die Angreifer wurden beschützt und die GenossInnen des Sxolio wurden in ihrem Gebäude eingeschlossen. Wir sollten uns nicht täuschen lassen: Ohne der Mazedonien-Demo wären diese Angriffe der Faschisten nicht möglich gewesen, denn diese Demo war ein Schutzraum für die faschistischen Angriffe. Die Angreifer gingen zu dieser Demo und kamen von ihr wieder zurück. Alle rechtsextremen und neonazistischen Gruppen riefen zu dieser Demo auf, aber niemand kümmerte dieses Faktum. Ihnen wurde dadurch soziale Legitimität und öffentlicher Raum geboten, um sich auszudrücken und zu handeln. Wir sind uns ganz genau bewusst, dass diese Dinge unter anderen Umständen nicht möglich gewesen wären, und deswegen muss jeder und jede darüber nachdenken, wie er sich gegen Faschismus stellen kann. Diese Aktionen paramilitärischer Gruppen funktionieren als Unterstützung der staatlichen Repression gegen alle Menschen, die kämpfen, und für etwas Besseres einstehen. Denken wir alle darüber nach, wer von der Brandstiftung an einem Gebäude mit einer mehr als hundertjährigen Geschichte profitiert, welches über Jahrzehnte leer gestanden ist. Ein Gebäude, das wir als Anarchisten, libertäre Kommunisten und Revolutionäre besetzt und renoviert hatten, einerseits um den Bedarf an Wohnraum von Proletariern, Immigranten und Menschen, die von Staat und Kapital angegriffen werden, zu decken, andererseits, um einen freien Raum radikaler politischer Auseinandersetzungen von Individuen zu schaffen und eine neue, libertäre Kultur zu fördern. Es muss deutlich festgestellt werden, dass es sich um eine kriminelle Aktion handelt, die auch ein weit tragischeres Ergebnis zur Folge gehabt haben könnte: Tote. 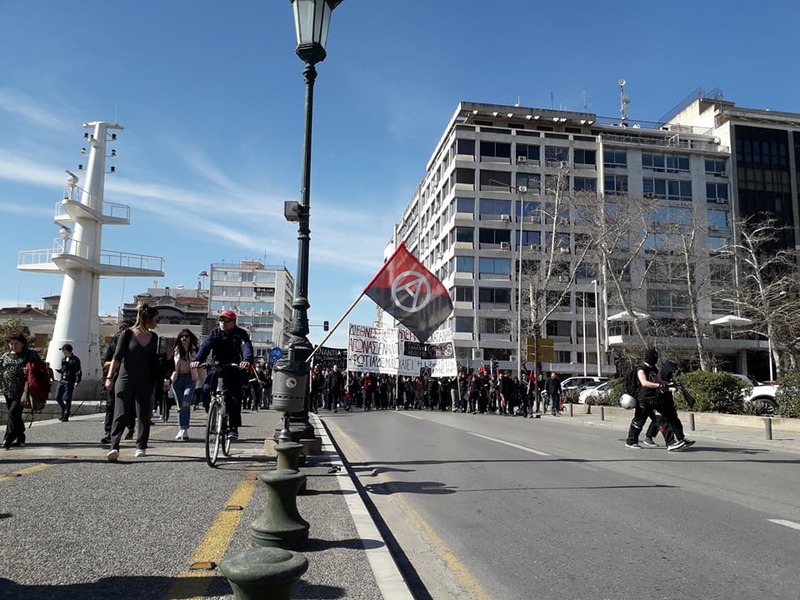 Sunday 21.1, around 13:30 and right before the nationalistic demonstration about the “Macedonian” issue, fascist groups which were participating at this demo started a series of attacks to occupied spaces. Right after they attacked Free Social Space “Sholeio” (School) and they were repelled, they approached our squat and damaged our facade and fence. Those attacks originated from the organized demonstration of “Kiklos Ideapolis” and other small fascist groups (AME, Ieros Lohos, C18). The damages were restored directly from members of our collective who, right after, chose to support the antinationalistic demonstration in Kamara. 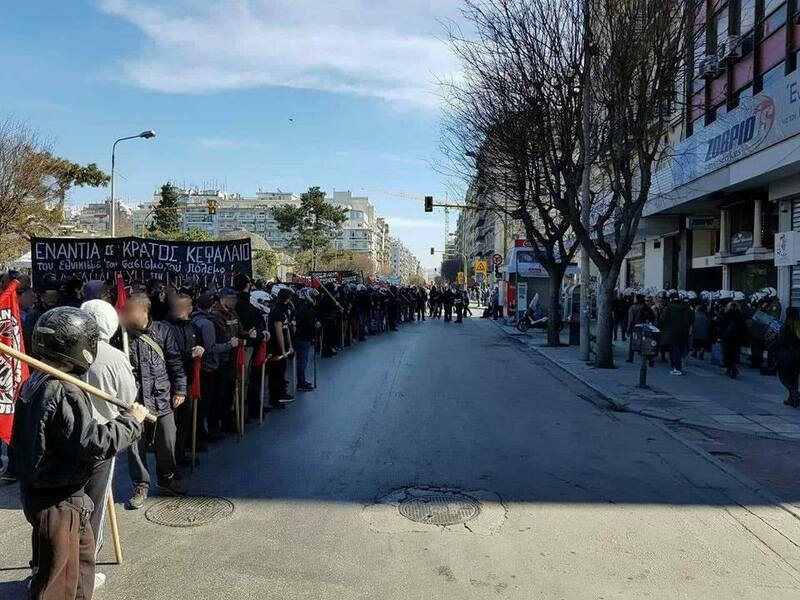 Two hours later, the same groups along with fascist hooligans of PAOK and Serbian neo-Nazis tried to attack the demo at Kamara and were repelled. After that, they marched and attacked again our space with molotov cocktails and flares, causing it’s arson. At that time, there were no people inside, because they were participating in the antinazi demo. Also, during their attack, undercover cops were outside the squat and a riot police bus was parked near the incident. Of course, they didn’t do anything to stop the attack. At the same time, the neighbors were shouting from their balconies to the fascists, who answered with insults and by firing flares to them. When the nazi groups tried to approach again “Sholeio”, police kept the same stance. They covered their attack and blocked the comrades inside their squat. There are no excuses about what happened that day. Everybody in the city knows that the attacking groups were moving to the direction of the White Tower (the gathering place of the nationalistic demonstration), and later they were leaving from that place. This demo worked as a place to launder greek fascism. New political careers started to take place that day. At the same time “dirty” politicians were amongst the gathered people. 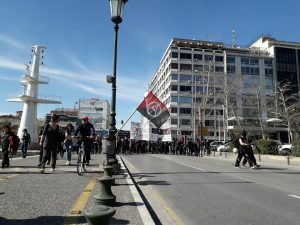 The murderers of Golden Dawn were wandering around the demo, along with the new “storm troopers” committing murderous attacks hand by hand with the police. The rest of the (far)right wing could not miss this gathering (New Democracy and Independent Greeks parliamentary parties). Sold-out nationalistic “left” (LAE: Popular Unity and Plefsi Elefterias: Course to Freedom) and our Christian «loving» church were also there. All of them composed the far-right entity that this country needed so much and whose plans were blocked after the murder of Pavlos Fyssas. The creeping fascism of greek society found social legalization and only the antifascist movement can reverse this situation. All of that happened in Thessaloniki. At the whilom multicultural “capital” of the Balkan peninsula, the city of refugees, persecution and extermination of the Jewish and other ethnic populations, the city of the murdered workers in 1936 and the murder of Lambrakis in 1963. Among the crimes of fascism and nationalism that have happened in this city, one more came to add, the arson of a historical building, which was standing for over a century. Unfortunately, whoever forgets history must be ready to live it again. Let everyone consider their stance against fascism. Passivity and indifference, along with de-politicization that dominates society feed fascism every day, while the nationalistic frenzy worked as a fuse for the explosion of that day. Everyone should consider whom fascists gained power from, whose interests they acted for, with whose backs they did what they did. We will always be, along with our comrades, on the streets to give the daily fight against fascism, constructing bulwarks to its expansion until its total elimination. 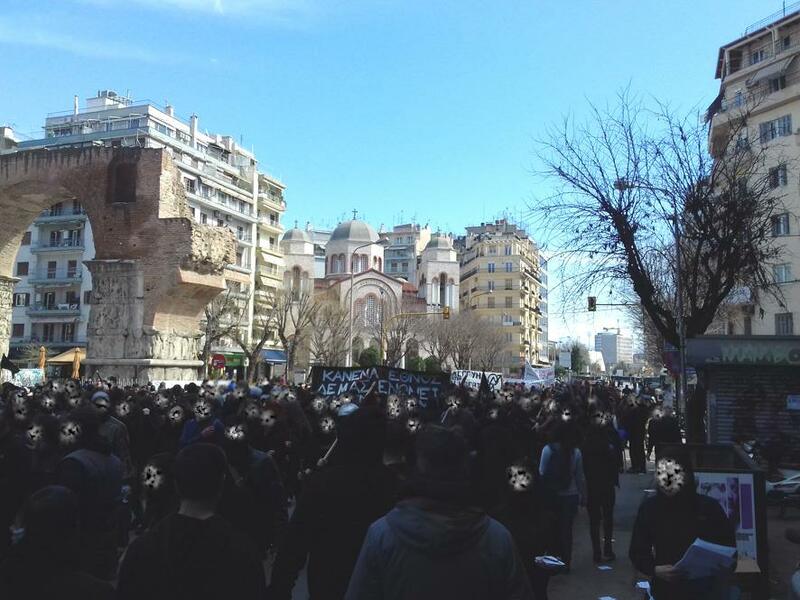 Among the ranks of the fascists who attacked the antinazi demo at Kamara, and those who made the second attack at our squat, there were also ultras of PAOK. This is a fact and is clear from the insignia they had on them and also from their chants that were applied with spray cans on the facade of our squat. At that point we must make something clear. The mayor of the city tried crudely to present the attack on our space as a conflict between PAOK ultras. The official announcement of the team’s ultras stepped on that and tried to hide the nazis in their groups by not making a clear statement of which groups signed it. Already, several of them denounced it. We call the antifascist ultras of PAOK to take a position, along all the other ultras of other teams, to isolate the nazis from the benches and from everywhere. Because, antifascism for us is not just a banner or “lifestyle”, but political decision and historical responsibility. At this volatile situation our collective chose to demonstrate on the streets against fascism and take the responsibility of this political decision. The price we paid is heavy and weighs, first of all, our backs. The building that used to host our ideas, our concerns, our dreams for an equal and free society, without authority and exploitation is totally burnt. A building that we renovated on our own expenses and released from the previous state of abandonment and devastation. Our ideas and our struggles, though, are not just buildings to raze them down. We will not quit fighting at this critical point, but we shall stay put with our collective consciousness and tenacity hardened like steel. The “case of Libertatia” is not only ours to solve. The antifascist movement has to give the proper answers to the enemies of freedom. We stand up for our political decision to participate in the antinationalistic demonstration in Kamara on the same day that the nationalists would march in our city. We structure our political beliefs and actions in the way of everyday struggle against fascism on the streets from the organized antifa movement, against the logic of “hooliganistic” actions. The decision of the anarchist movement to act, take a political and physical stand against fascism was clear the days that passed. One massive standing demo with sound system and spreading flyers and one big motorized demonstration downtown were actions which took place the week before the anti-demo which came at last on the 21st of January. All these show which collectives of the movement took historical decisions and kept their part of responsibility. Unfortunately, radical left was missing from this date with history. They chose not to support the antinationalistic demonstration, while they were trying not to damage their social profile against the massive nationalistic parade. 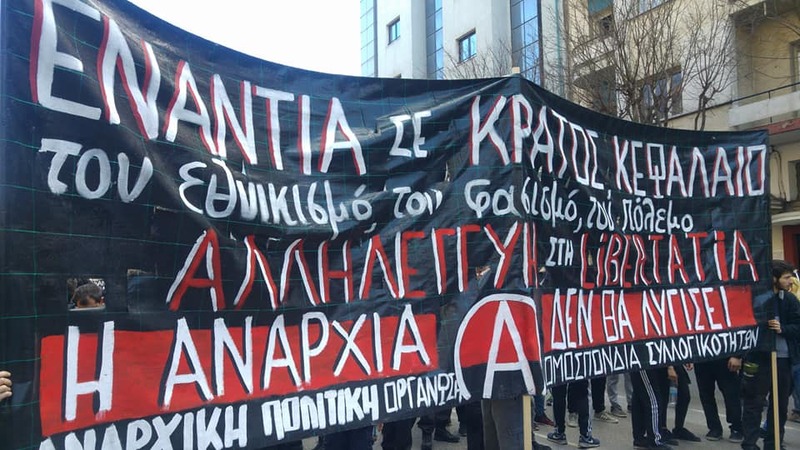 On our part, the hardest decision was that we chose not to weaken the antinazi demo, which had been called by specific political collectives of the anarchist-antiauthoritarian movement, when our squat was being attacked. A hard decision considering the result of it, but in a matter of political terms, the right one to take and the most responsible towards the rest of the collectives and comrades who were standing with us at Kamara. For those who wonder why the comrades who restored the damage on our squat after the first attack didn’t stay there, or why there was no guarding shift for the building, we would suggest they consider the value of human lives as well and what the loss of those would have meant. It’s also good to point out that the existence of this feisty antidemo created a safe zone downtown, preventing possible attacks on the squats of the neighborhood and pogroms against refugees, lgbtqi+ people and alternative “lifestyle” individuals. The incident of the arson of Libertatia squat could have happened elsewhere if nothing was there to prevent it. Now is not the time to open a post-mortem discussion with insulting critiques against our collective and cannibalistic attitude inside the antifascist movement. Now is the time for convolution and massive answers opposing fascism which tries to gain power and get social legalization. At those hard times the decisions we take have historic value and the antifascist movement must stay put on the streets against the fascist masses. 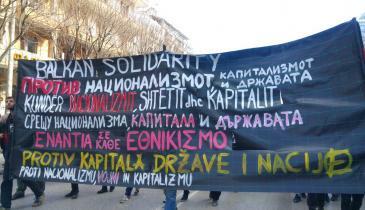 The day after the attack we called for a solidarity demonstration right outside our squat. The call gathered around 2.500 people of the anarchist and radical left movement. Our goal was to march in the neighborhoods of the east part of the city and end at the Free Social Space “Sholeio”. The cops didn’t let the demo move into big streets and, by blockading them, led us into narrow ones. There, for a non-important incident, they attacked our block with teargas, flash bang grenades, physical violence etc. The aftermath was 5 arrests, one member of our collective amongst them. The decision of police to repress the demonstration and, later on, to keep our 5 comrades under custody, shows the political stance of the state against us. One day, they stay side by side with the fascists who burn squats, and the next they attack massive demos and arrest comrades, accusing them of arson on a tire of a riot police van, while, only some hours earlier they had seen a whole building getting burned. The fact that the accusation transformed from misdemeanor to felony by the district attorney shows the political decision of the state to repress the antifascist movement. And this happens because arson transforms to felony when there is a human life in danger. We think that everyone understands where danger existed and where not. The point at this moment is how we will continue to exist as a collective. Our will is to keep the space occupied, if possible, to rebuild the house, to make the squat functional again. We make a clear statement to any blockbusters, state workers and officers, fascists and any kind of hustlers: LIBERTATIA SQUAT SHALL STAY ALIVE! We shall not abandon the building, we will continue our non-retreatable antifascist struggle. At this point we should thank every one of you that showed us what solidarity means. Thank you comrades from every corner of Greece and abroad! Your political stance gives us the strength to continue our struggle. It is during such hard times, that comradeship becomes real and solidarity is not just an obligation, but revolutionary duty. We want the people that are already motivated to show their solidarity to stay put about the issue. Soon we will inform in details on our next steps and plans. At this moment, the reaction of the antifascist movement, which must answer to the circumstance united and empowered in public on the streets, is equally important. We must leave no public space free for the fascists and nationalists, we must fight back with internationalism, class and antifascist solidarity. The movement must rally against the common enemy, which are the state and the capital, and their storm troopers, the fascists.